Journal of Computer Research and Development, Vol. 51(2): 239-324, 2014. Editorial of special issue on Smartcity, Journal of Computer Research and Development. IEEE Communications Magazine, Vol. 51(6): 70-141, 2013. 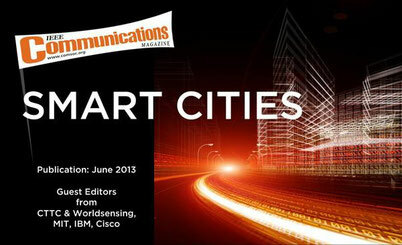 Editorial of the special issue on Smart Cities, IEEE Communication Magazine. Recent advances in pervasive and ubiquitous computing provide a glimpse into the future of our planet and reveal exciting visions of smart cities, homes, workplaces, hotels, schools, and much more. Driven by a technological evolution offering "low-power many things and wireless almost everything"-for example, IEEE 802.15.4 radio, wireless sensor networks, and sensor platforms-we could, in only a decade, envision and prototype impressive smart-space systems that improve quality of life, enhance awareness of resources and the environment, and enrich user experiences. For most of these systems, the goals are clear and convincing. But prototyping is one thing-commercial proliferation and creating a new industry are another. This special issue offers four articles on smart cities covering the IT perspective, applications and services, interaction and user experience enrichment, and a fast-progressing smart-city initiative in South Korea. The topic will obviously be revisited in the future to assess progress and refine our understanding of the changing landscape of goals and requirements. We look forward to your active participation in this area and to receiving your future contributions on this topic. Editorial of the special issue on IT Footprinting—Groundwork for Future Smart Cities, Computer. This special issue focuses on the topic of urban computing because we feel it is important to consider public spaces as potential sites for the development of computing. The articles presented here point to issues of theoretical understanding of these spaces, as well as the technical feasibility of technology design and development. We are not calling for technology designers to become urban planners and social scientists, but we do suggest that there is a wealth of research in these areas that needs to be taken into account when designing new technologies. Collaborations are crucial to understanding social life and creating technologies that can augment it in positive ways. We believe that research in urban computing can be useful for augmenting and extending existing theories in relevant fields and for greater blending of these fields into a coherent understanding of public social life. The articles presented here were selected based not only on their ability to shed light on the field, but also for their collective impact—each offering a different perspective on public computing. Computer-IEEE Computer Society, Vol. 39(9): 36-72, 2006. Editorial of the special issue on Urban Computing: Navigating Space and Context, Computer. Urbanization’s rapid progress has modernized many people’s lives, but also engendered big issues, such as traffic congestions, increased energy consumptions, and environmental pollutions. Urban computing aims to tackle these issues by using the data that has been generated in cities, e.g., traffic flow, human mobility and geographical data. 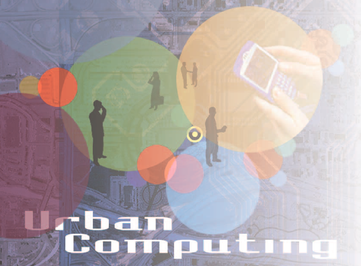 Urban computing connects urban sensing, data management, data analytics, and service providing into a recurrent process for an unobtrusive and continuous improvement of people’s lives, city operation systems, and the environment. Urban computing is an interdisciplinary field where computer sciences meet conventional city-related fields, like transportation, civil engineering, environment, economy, ecology, and sociology, in the context of urban spaces. The objective of this special issue on Urban Computing is to bring together top-quality articles on the art and practice of urban computing to demonstrate and discuss its scopes, methodologies, applications, and potential research topics. We received 34 submissions from which 9 articles have been selected for publication after an extensive peer-review process. ACM Transactions on Intelligent Systems and Technology, Vol. 5(3), 2014. Editorial of the special issue on Urban Computing, ACM Transactions on Intelligent Systems and Technology. Urban computing is a process of acquisition, integration, and analysis of big and heterogeneous data generated by a diversity of sources in urban spaces, such as sensors, devices, vehicles, buildings, and human, to tackle the major issues that cities face, e.g. air pollution, increased energy consumption and traffic congestion. 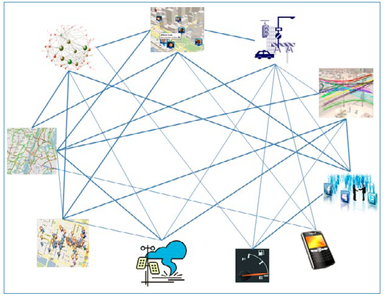 Urban computing connects unobtrusive and ubiquitous sensing technologies, advanced data management and analytics models, and novel visualization methods, to create win-win-win solutions that improve urban environment, human life quality, and city operation systems. Urban computing also helps us understand the nature of urban phenomena and even predict the future of cities. Commuincations of the CCF (CCCF) published a feature on the urban computiong topic. The special issue includes five papers contributed by researchers from MSRA, TELECOM INT, The University of Tokyo, Zhejiang University, and Peking University. Communications of the CCF, Vol. 9(8): 6-38, 2013. Communications of the CCF, Vol. 8(5): 6-42, 2012. Communications of the CCF, Vol. 6(6): 8-44, 2010.